Legendary musician Bart Willoughby joins us on the Pan African Space Station LIVE from MUMA in Melbourne for a live performance on Saturday 13 April from 15:00 – 16:00 (AEST). 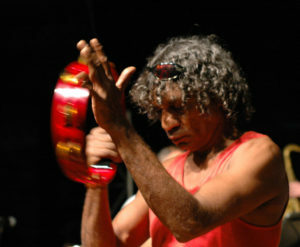 Multi-instrumentalist and pioneering Aboriginal reggae artist Bart Willoughby was a founding member of the influential No Fixed Address in the early 80s and Mixed Relations in the 90s. He was the first Indigenous artist to score a feature film, the first to sign a record deal and tour internationally with No Fixed Address. He is currently touring and continuing to record albums with Mixed Relations, now known as The Bart Willoughby Band.